In previous articles, we’ve discussed the differences between Integrated ELD and Designated ELD. We made the point that Integrated ELD instruction is sharpening the focus on language in regular lessons in all content areas. Designated ELD instruction is a separate time set aside in the school day where students can focus on English language skills, using content area texts for examples. Both are needed. As we’ve said many times before, the key to a good lesson is that it must be well-crafted and well-taught. DataWORKS chief researcher Dr. Silvia Ybarra says, “A well-designed lesson can be taught poorly, but a poorly-designed lesson cannot be well-taught.” In either case, student learning suffers. Teachers have to master both design and delivery – and actually they can download well-designed lessons from educeri — but the delivery is up to them. So, let’s take a look at what makes up a well-crafted lesson for Designated ELD instruction. According to the California ELA/ELD Framework1, there are three main premises of the ELD Standards. Use English Purposefully. Students gain skill in using language that is appropriate to grade and content. They do this by practicing describing, explaining, persuading, informing, justifying, negotiating, entertaining, retelling, and so on. Interact in Meaningful Ways. Students use three communication modes to gain and exchange information and ideas. They collaborate, interpret, and produce meaningful messages. Understanding How English Works. Students apply language to academic tasks in different content areas. They learn to structure cohesive texts, expand and enrich ideas, and combine and condense ideas. In addition, the Framework identifies 10 essential features of Designated ELD Instruction. We’ll list those and note how they can be easily achieved with elements of Explicit Direct Instruction (EDI) that are featured in all our educeri lessons. Intellectual Quality. Students are given challenging tasks with support. We recommend using higher-order questions and making lessons concept-based to achieve this quality. Academic English Focus. Building student language proficiency with academic English is the focus. We recommend defining academic vocab in lessons, and having students use complete sentences with academic vocab in pair-shares and checking for understanding answers. Extended Language Interaction. Students are given planned opportunities to speak, listen, and write in English. We recommend choral reading and extensive pair-shares. Focus on Meaning. Students are guided to focus on the language that is critical to understand texts. 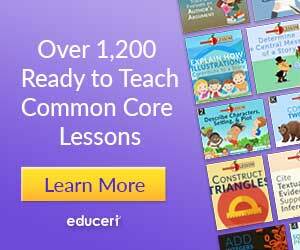 We recommend content-based examples for all language skill practice and concept-based lessons. Focus on Forms. The Framework asks for explicit instruction on how English works. We recommend analyzing the structure of sentences, paragraphs, longer texts, and all types of language. These are found in educeri grammar lessons. Planned and Sequenced Events. Lessons are planned and sequenced to build language proficiency along with content knowledge. We recommend using EDI lessons, which are posted on educeri, because they use seven research-based components of a good lesson structure that have been recognized by Goldenberg2 as the same components for good EL instruction. Scaffolding. Teachers bring in planned and spontaneous language instruction as needed. We recommend using Language Objectives throughout the lesson and adopting as many of the 50 strategies of EDI for English Learners3 as possible. Clear Lesson Objective. Lessons are designed using ELD standards as primary and using state standards as secondary. Educeri lessons can be easily adapted to ELD standards. In fact, we are in the process of labeling each lesson for all state and ELD and international standards. Corrective Feedback. Teachers provide appropriate feedback on language use that is not too much or arbitrary. We recommend using our seven guidelines for effective feedback that work with regular checking for understanding questions during the lesson. Formative Assessment Practices. Teachers frequently monitor student progress through informal means. We recommend using checking for understanding every two to three minutes during a lesson to assess comprehension, calling on random students not volunteers. Whiteboards can also be used. So, you see, a Designated ELD lesson is not something totally new. It’s just a good, well-structured lesson with a focus on the language use – and in a special time set aside for that focus. Let’s do right by our EL students, and give them the best lessons and the best delivery of those lessons! 3 EDI for English Learners, Hollingsworth and Ybarra, Corwin Press (2013). For more information, contact Dataworks for details about our Explicit Direct Instruction Workshop, our English Learners Workshop, and access to more than 1200 Educeri lessons online. The Best Designated ELD CURRICULUM students need to be college- & career-ready. the time set-aside, what is best practice for designated time when it comes to differentiated instruction at their level, i.e. what are the most common models today, do students switch to different teachers based on their level? Some would like to see students placed in classrooms based on their level of proficiency for the the whole school year (e.g. teacher A gets the beginning EL’s, Teacher gets the intermediate EL students and so on. What is the best approach? For designated ELD time, separate students by language proficiency levels not by grade levels. Generally, teachers are assigned a proficiency level, and students move to a different classroom for ELD time. We also recommend some age separation. For example, you can provide a K-2nd beginning ELD class and a 3-6th beginning ELD class. Using this grouping, K students and 6th grade students are not in the same class together, even though they are being taught the same ELD content. Students can be placed in ELD levels using test results or teacher evaluation. However, the grouping should be dynamic. Be ready to re-level individual students. If a student is consistently struggling, move him down a level. If the content is already known, move the student up a level.